Winter is here and it's a time to celebrate family and love with gifts by the tree. 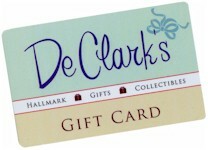 For every holiday this winter, you can be sure to find gifts for the entire family at DeClarks. Browse our latest 2017 Winter Catalog for the special people in your life and stop by our location at Town Country. From gifts to cards to gift wrapping needs, we have you covered.